Stone planters are popular at home as well as in commercial settings. They add a touch of classic elegance, and are perfect for displaying large tropical palms, shrubs, and container gardens. They are a stunning compliment to porches, patios, driveways, and entranceways. The unique variations in color that occur as stone containers age add beauty and interest to your landscape or garden design. Cast Stone Planters – What Are The Advantages? These heavy duty containers protect plants from extreme temperatures. Cast stone has been around for many years, and is a durable alternative to other materials such as terra cotta, ceramic, or plastic. Natural stone containers change color as they age, and blend in beautifully with tropical gardens and landscapes. 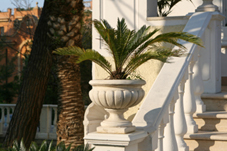 Faux planters made from fiberglass are a light weight option ideal for terraces and decks. Decide what the planter will hold. Choose a planter that will accommodate the roots of the tropical tree, shrub, or plant when it reaches maturity. If you need the ability to move the planter for any reason, think twice about buying a genuine stone planter. Fiberglass or resin containers provide the look and feel of stone without the weight restrictions. The plant(s) that will reside in the container. The location you choose for the container. The design and style of your garden, landscape, or home. Choose a color and/or texture that compliments your landscape as well as the architectural style of your home. These planters are available in a variety of colors, styles, and textures. If you cannot find one that fits your needs, you can have one custom-made to your specifications. Caring for planters properly will keep plants healthy and ensure the container is structurally sound. Limestone planters are durable and require minimal care. These containers are heavy, so be sure to install them properly. Some pieces may require special equipment for handling. If your plant grows larger than expected, re-pot if necessary. Expanding roots could become root-bound and damage the plant, or cause cracks in the planter. Watering plants in freezing temperatures can cause stone containers to crack if the water freezes. Proper drainage is important for planter performance. Check for drainage holes. Consider moving smaller planters to a location (such as a garage or shed) that will protect the planter from freezing temperatures. Follow instructions for installation and care that are provided when you purchase the planter.